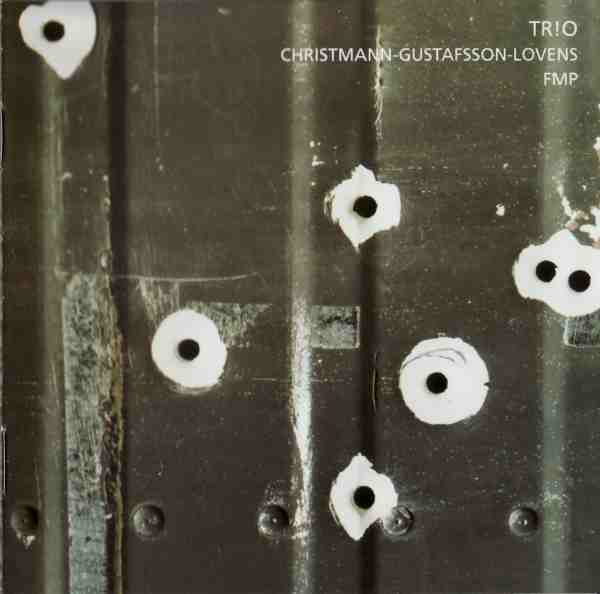 In 1994 cellist and trombonist Günter Christmann, drummer Paul Lovens and saxophonist Mats Gustafsson performed together for the first time as a trio. Now, in 2010, their performance is released on CD. Musically, it shows that what was avant-garde then still is avant-garde today, sixteen years later, and very much so. The music also demonstrates that even within avant-garde, this trio was thinking quite ahead. What you hear is an incredibly intense interaction between three masters, barely using their instruments other than to produce sounds - not phrases, not melodies, just timbral explorations of coloring, restrained power, blocked flux, sudden release, shades, changes in intensity, and all this against a broad canvas of silence. Critics who claim that all modern and avant-garde jazz is just noise will find both denial and confirmation here. It is not noise in the traditional sense : the volume is kept down, allowing for even the most subtle of movements to be picked up by the mikes. No other music, not even classical chamber music, allows for such nuance of sound perception. Yet it is noise in its most traditional sense, in its most primitive and basic meaning : what you hear are scraping, screeching,clattering, gurgling, hammering, hissing, shouting, rumbling, ticking, weeping, thundering, chattering, ... all coming out of instruments, not in a structure, but raw and in immediate reaction or as propulsion for other sounds. Ten years ago, I would have run away from this as fast as I could, arms in the air screaming bloody horror. Today, and don't ask me why, I can listen to this intently, as I have done several times back-to-back and in bits and pieces, enjoying the incredible power contained, almost locked-up, in this music, full of tension despite its minimalism, with sometimes no sound, then all three simultaneously letting out a shout from their instrument, as if read from some sheet music. The greatest quality of the music is the total effect, including what is not being played, not only in the silence, but in what is being suppressed. That is by itself a rare achievement. Watch a more recent performance by the trio. There is less silence here than on the album, but it will give you an idea of what kind of music they bring. Maybe I'm still in my "ten years" before... Perhaps it will never come... Hard to predict! Today, makes no sense for me! Not all free and avante garde jazz sounds like this. There is some I like and and I do not like. I agree it is not all noise but some of it is pretty difficult to listen to. Well, I must say that it is hard to describe. Yes, often it does, yet not always, as in this case. Mats Gustaffson is a total wanker. Point finale.